Independent Directions to this Site: From Highway 417 (The Queensway) take exit 138 (Eagleson/March Roads). If travelling west, the 0.6 km offramp dumps you right or north onto March Road. If driving east, a 0.5 km offramp brings you to Eagleson Road, where you will turn left or north onto it to March Road (its northward extension) and in 0.5 km join the westbound offramp traffic. Both groups will now follow March Road, or Regional 49, north, then northwest, 8.1 km to to a 90 degree lefthand turn and the junction for Dunrobin Road. Take a right onto Dunrobin Road and continue northwest 9.4 km to the Bill Mason Outdoor Education and Environmental Studies Centre on the right behind the West Carleton Secondary School. Dunrobin & Carp Ridges Route Directions: From wherever you are on the Thomas Dolan Parkway near Constance Creek, continue straight or southwest to Dunrobin Road. Turn right or northwest on Dunrobin Road and proceed 1.8 km to the turnoff, on the right, behind the West Carleton Secondary School, for the Bill Mason Outdoor Education and Environmental Studies Centre. 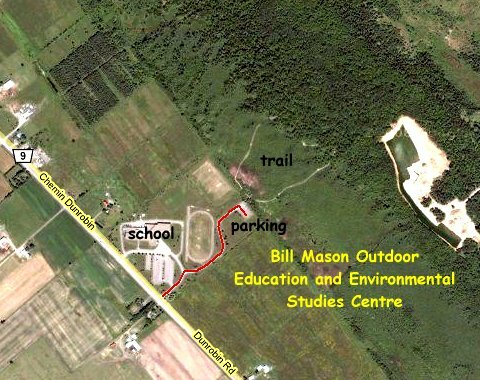 Site Description and Birding Information: Opened in 1988 and named after a distinguished Canadian naturalist and outdoorsman, the Bill Mason Centre is located on Dunrobin Road, where it shares facilities with West Carleton Secondary School. The “outdoor classroom” consists of 77 acres, designated partly as municipally Special Features Land, partly as provincially identified Class 1 Wetlands. For more information visit the Bill Mason Outdoor Education and Environmental Studies Centre website. The wetlands boast an extensive system of boardwalks, while the forested section of the site contains graveled trails that are wheelchair-accessible. The site comprises three excellent examples of ecosystems ideal for environmental-education purposes: wetlands, forests and their associated vernal ponds, and second-growth meadow. There are two shelters located on the property, one at the entrance and one at the back in the meadow. The marsh area has all the regular denizens; Sora, Virginia Rail, Marsh Wren, etc. The variety of habitats leads to good variety of bird species. Dunrobin & Carp Ridges Route Directions: From the Bill Mason Outdoor Education and Environmental Studies Centre on Dunrobin Road, turn right or northwest on Dunrobin Road and go 4.3 km to Kinburn Side Road. Turn left or southwest on it and proceed 3.1 km to Torbolton Ridge Road, our next site. Turn right or northwest on it. This is part of the Carp Ridge.